10–12 September at the National Oceanography Centre – NOC is hosting a UK Integrated Marine Observing Network (UK-IMON) workshop on from Tuesday to Thursday, 10–12 September, looking at new technologies for monitoring the marine environment. This Defra-funded workshop aims to prioritise those technologies that are likely to provide i) the greatest cost savings, and ii) the greatest advances in data resolution, in the future. 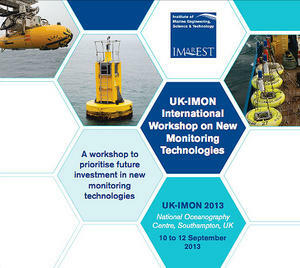 The first part of the workshop has UK and international experts providing overviews and flash talks on different marine monitoring technologies, under the headings of conventional platforms (ships, buoys, landers), autonomous systems (AUVs, gliders), sensors, and other data acquisition systems, (such as satellite remote sensing). The second part will involve structured discussion about prioritisation of investment in new technologies for Government, research and industry. Criteria for ranking will include cost, relevance to policy, novelty and innovation, technology readiness level, and feasibility. Numbers are limited to just over 100 participants, so early registration is needed to ensure a place.